It’s official: the acoustic in Margão’s Ravindra Bhavan auditorium is far superior to that of Panjim’s Kala Academy indoor auditorium. I rarely visit the Ravindra Bhavan due to the distance, and more recently the horrendous traffic jams getting there from North Goa. I had long suspected this to be true, from the first time I heard a performance (Musica Fiorita, 2011) there, and more recently when I performed on stage last December at the Prof. Micael Martins tribute concert. But the perfect opportunity for a controlled comparative study presented itself with the back-to-back performances in two consecutive days of the same orchestra, Das Bundesjugendorchester (the National Youth Orchestra of Germany) at both venues, first in Panjim then in Margão. And it helped that they played many works (Jón Leifs’ ‘Geysir’, Dvořák’s Slavonic Dance no. 1, and Johann Strauss II’s ‘Thunder and Lightning’ Polka) in both. No question of observer recall bias in such a short span of time. In many respects, the design concepts in both places are similar. Both suffer from unnecessary loss of sound upward and sideways due to the lack of a shell. 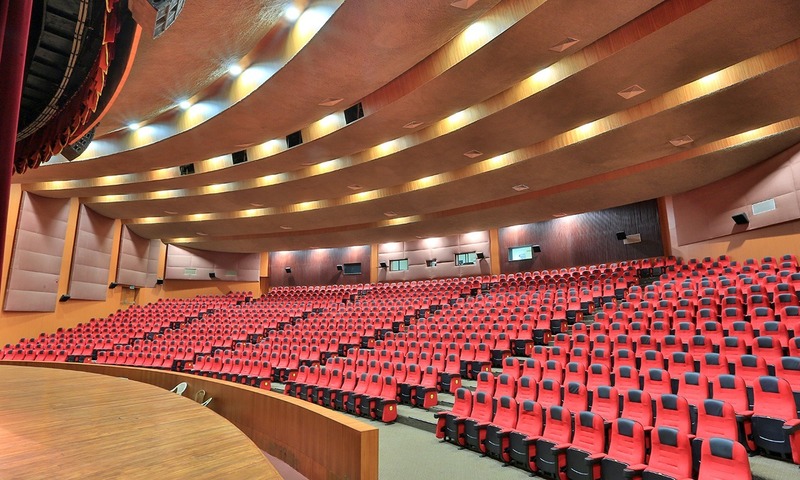 But Ravindra Bhavan doesn’t have such a cavernous backstage space as the Kala, so the sound loss is smaller. Furthermore, it’s a newer venue, has a lower ceiling, and it does have some wood lining in the audience area, so perhaps this helps the sound quality. And it doesn’t have the badly placed exit-doors of Panjim, with even more dead space leading out of it. What is undeniable is that it is a far better listening experience. The audience behavior at the German concerts in both places, however, left much to be desired. While I applaud the enthusiasm of the organisers for ‘bringing music to the masses’, an objective I heartily share, there have to be ground rules. Those who took the trouble to turn up well in advance shouldn’t have to pay the price and have their experience marred by others who saunter in well after the start time of a performance. Perhaps there is some merit in tagging seat numbers even to free passes, and ensuring that only those with valid passes do get in, even if they are released democratically, first-come, first-served. If this can be enforced at IFFI, it can be done elsewhere. Standing and sitting in the periphery and aisles is a noble ideal, but in my experience it doesn’t work in practice, not in Goa. There are Stehplätze (standing-places) in German-speaking countries for classical music concerts, but even these are finite, few in number, and those occupying them behave themselves really respectfully, grateful for the opportunity to hear great music for free, or almost free. One can understand first-time concert-goers not knowing everything about concert etiquette, and I do not at all belong to the anti-clapping-between-movements police, but do even basic courtesy, common-sense and respect (being silent and not fidgeting when performers are playing their hearts out on stage) have to be taught? Some of us act collectively in public places as if we are at home, but a concert venue is also a shrine to high art, and we have to treat it so. The unflattering acoustic in the Kala, and the stark absence of hushed quiet necessary to fully appreciate the opening of Leifs’ ‘Gysir’ in the nether regions of the register of the bass tuba and then the rest of the orchestra, made the work incomprehensible in Panjim, and for no fault of the orchestra. But it came vibrantly alive in Margão. Margão got preferential treatment, with a whole extra half-hour of concert length. For so many reasons, the Margão concert was much more enjoyable, and I am so glad I made the trip, along with our young student Irfan Shimpiger, who was visibly moved by the performance. The choice of concert repertoire added much to this. All the young soloists really shone. Irfan is working on the J. S. Bach Double Violin Concerto in D minor (BWV 1043), so to hear it played so immaculately, not just by the two soloists, but also the moving bass line especially in the last movement played so sensitively by the lower strings in the sparse forces appropriate for a Baroque work, was an eye- and ear-opener for him. January has been a glorious month for orchestral music in Goa, what with the Czechs first and the Germans close on their heels. We got even more Dvořák from the Germans: his ebullient Serenade for winds, cello and double-bass, opus 44, and his eloquent Rondo for cello and orchestra in G minor, opus 94, all of which remind us what a brilliant orchestrator and tune-smith he was. If you were at any of the concerts, chances are that his melodies stuck in your head (they certainly did in mine), elbowing away even Johann Strauss for your ear-worm space. The Rondo in particular caught Irfan’s fancy, as he hummed it all the way home. Mention must be made of Mozart’s ravishing Clarinet concerto; it was a pity we heard just the first movement. Ignaz Moscheles’ Concertante for Flute, Oboe and Orchestra isn’t standard concert repertoire, and it is a charming work. The Margão concert was also memorable for me, as it was the birthday of young Anthea Luna-Marie Dias, (Winston Collaco’s student), who had just received the good news of getting a Distinction at her ATCL violin exam, no mean feat for an eleven-year old! It only underscores how much potential our children possess. Imagine what a marvelous music landscape Goa would be if we had more teachers of the caliber of Winston and even higher, across all the orchestral instruments. I invite you to dream this dream with me, because this is precisely what Child’s Play India Foundation (www.childsplayindia.org) is trying so hard to do, and can do with community support. I’ve said this before and I’ll say it again: Much has been written recently about a supposed ‘Renaissance’ in classical music in Goa. I will believe this to be true when Goa’s children are being instructed to play to a truly world-class level, across all instrument disciplines, and in every nook and cranny of the state. It is well within reach if we only make the financial and emotional investment and long-term commitment towards this objective. Only when we invest in early (and I mean at the primary school level and all the way up) and consistent teaching of the highest level in all disciplines, strings, woodwinds and brass, can we effect real change. Until then, mere catchphrases are empty rhetoric. I can humbly request you to include me as an avid reader of your column on Sunday Navhind times.